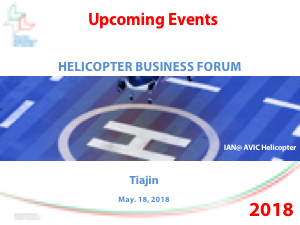 The Italian Aerospace Network (IAN) jointly with AVIC Helicopter and Tianjin Goverment and with the support of the China-Italy Chamber of Commerce (CICC), invites you to take part to the HELICOPTER BUSINESS FORUM 2018, which will take place on May 18th 2018 in Tiajin. HELICOPTER BUSINESS FORUM 2018 is the first business forum focused on real business opportunities arising from AVIC Helicopter needs and from an already established cooperation based on a mutual and trusty relationship. AVIC Helicopter is starting new programs and it is looking for new qualified suppliers. IAN has been commited to scouting new potential qualified suppliers for AVIC Helicopter. HELICOPTER BUSINESS FORUM 2018 represents so an unique opportunity for the Italian companies to boost their business into Chinese helicopter market. The participants can go directly to the main and most important part of the business development, the technical meeting with their potential customer. HELICOPTER BUSINESS FORUM is articulated into two sessions (morning and afternoon). The morning session is within the plenary session of Word Intelligent Congress (WIC 2018). The afternoon session is mainly focused on B2B meetings between AVIC Helicopter technical departments and the Italian companies.